Crowdsourcing a tree can be a fun diversion. It can also work. The algorithms that provide hints to an online tree on Ancestry.com, for instance, can be useful. Connecting with someone researching a common ancestor can break down brick walls and build up family connections. But sometimes those algorithmic hints can lead you astray. Mordeche Hirsh Polinsky is a great example. Mordeche, also known as Mordecai and Max, had seven children. He had at least four brothers. His brothers also had many children. Online, there are numerous versions of the family tree, and almost all of them have the same mistake. 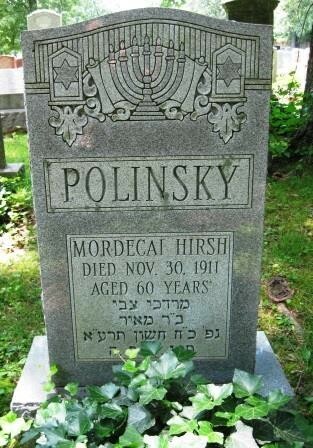 Mordeche Hirsh Polinsky did not die in 1911. Yet, the animated leaf keeps sending out hints that he did. Why? Findagrave.com has uploaded a photograph of Mordecai Hirsh Polinsky’s headstone at Beth Hamedrosh Hagadol Cemetery which clearly shows a death date of 30 November 1911. Same thing with Billiongraves.com. The headstone must be correct – the family placed it there and it’s inscribed in stone, afterall. Two other sources offer information that conflict with the headstone. The St. Louis Post-Dispatch printed burial permits in the newspaper, regardless if the family could afford to purchase an obituary. On 2 December 1910, the Post-Dispatch announced a burial for “Max Polinsky.” At first glance, they do not appear to be the same person, however, Max is a known Americanization of the name Mordeche, and Max was the name Mordeche used for the 1910 Census. The second source is a death certificate for Max Polinsky. The death certificate gives the date of death as 30 November 1910. The address on the certificate matches a known address for the family. The informant on the death certificate is Max/Mordeche’s son “P. Polinsky” and his full name was signed i n Yiddish: “Pincus Polinsky.” The burial took place on 30 November 1910 at Hamedrosh Hagadol Cemetery, the same cemetery as the headstone in the photos. The name of Max’s father listed on the death certificate is “Meyer,” the same as what is written in Hebrew on the headstone. The newspaper and the death certificate indicate a date of death in 1910, but the headstone has 1911. Which is the correct year? 1910. On a trip to St. Louis, I spoke with the executive director of Beth Hamedrosh Hagodol. We walked together in the oldest part of the cemetery, where Mordeche Hirsh Polinsky is buried. I asked him about the stone and told him about the conflicting dates. He smiled, and explained that the stone in the photograph is not the original one. It was replaced, probably in the 1950s, as the old stones were deteriorating from age and weather. The original cemetery records from 1902–1937 were destroyed in a fire. The mistake could have been misreading the old, crumbling stone when creating the new one, or misinformation from the family. Is a year difference a big deal? The Genealogical Proof Standard requires both a “reasonably exhaustive search” as well as a “resolution of any conflicting evidence,” so in this case, to meet the standard means to examine resources other than the headstone. Which leads to the conflicting evidence, and sorting out the proper conclusion. So think twice before hitting “accept” on that shaking leaf, or merging a tree with another. Better yet, get out a rake, pile up the leaves, and be prepared to put many of them on the compost pile. It will avoid a small mistake, like the wrong year being added to the tree, or a big one, like the wrong person. The internet has revolutionized genealogy, but the hard work of proof remains just that, work.